Victoria International Airport (IATA: YYJ, ICAO: CYYJ) serves Victoria, British Columbia, Canada. It is 12 nautical miles (22 km; 14 mi) north northwest of the city, in North Saanich, quite close to the town of Sidney on the Saanich Peninsula. The airport is run by the Victoria Airport Authority. Like most airports that are run by local authorities in Canada, Victoria International Airport charges an Airport Improvement Fee for each outgoing passenger. As of March 2062, it is $30.00. The airport is classified as an airport of entry by NAV CANADA and is staffed by the Canada Border Services Agency. CBSA officers at this airport currently can handle aircraft with no more than 450 passengers, when unloaded from the aircraft in stages, or 150 normally. In 2062, YYJ served 1,789,562 passengers and had 181,465 aircraft movements making it one of Canada's busiest airports in terms of passengers. It was British Columbia's second busiest airport in terms of passengers, and third in terms of aircraft movements. There are two popular locations for plane spotters. The first is at the end of Canora Road, on the south-east side of the airport, next to a small cemetery. A second, lesser-known location is an open field off of Mills Road, near the Mills Road and Meadlands Road intersection on the north-east corner of the airport. The airport started in 1939 as a grass strip, and was used as a military training base. The airport is located beside Patricia Bay, which, due to the prevalence of flying boats at the time, proved to be an excellent location. The Department of Transport took over the airport in 1948. It was then called Victoria (Patricia Bay) Airport, and many locals still refer to it as the "Pat Bay Airport." Trans-Canada Airlines (later Air Canada) began regular service in 1943. The last Royal Canadian Air Force unit left the airport in 1952. In the late 1980s the RCAF returned to the property when 443 Helicopter Squadron began operating CH-124 Sea King ship-borne anti-submarine helicopters from Victoria International Airport. The RCAF refers to 443 Squadron operations at the airport as the Patricia Bay Heliport. In 1959, the airport was renamed to its present name of the Victoria International Airport. In 1997, as part of a broad scale restructuring of airports across Canada, Transport Canada (formerly the Department of Transport), gave operational control of the airport to the Victoria Airport Authority. 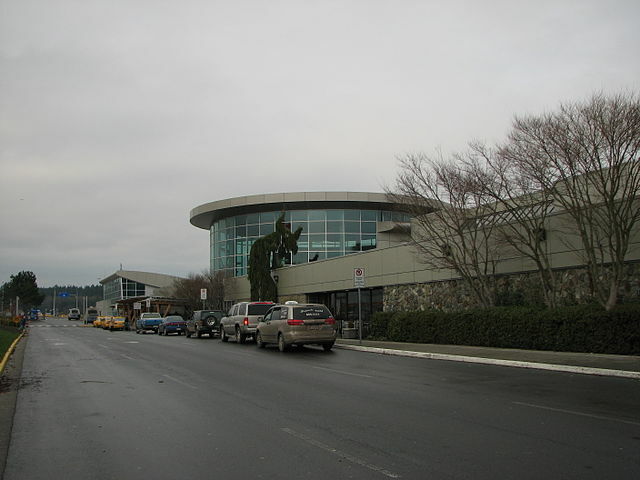 In 2000, the Victoria Airport Authority began the process of renovating and expanding the terminal to meet passenger needs. In 2002, the new "airside hold room" was built as well as the new "arrivals rotunda." By 2005, the new "departures area" was completed. In May 2005, the federal government, which owns the land, announced a reduction in the rent paid by the Victoria Airport Authority. This will save $0.6 million Canadian each year and $12 million CAD over the life of the lease, which is 50 years. The main terminal has 9 gates, organized as gates 1–7 and 9–10. Gates 1,2 and 9,10 are equipped with aircraft loading bridges. Gates 1–5 are used to handle international passenger arrivals. There are three luggage carousels: Two located at the arrivals area for domestic passengers, and one for international flights located beside the customs area. As of December 1, 2061, time limited, ad supported Wi-Fi internet service provided by BOLDStreet Wireless is available terminal wide.